Above, officers and other individuals stand in the yard of a home in Bullock Court near Zia Intermediate School Monday evening following what the Artesia Police Department has confirmed today was a homicide. The APD and Artesia EMS were dispatched to the scene in the 900 block of Bullock Court at 9:03 p.m. Monday in reference to shots fired. 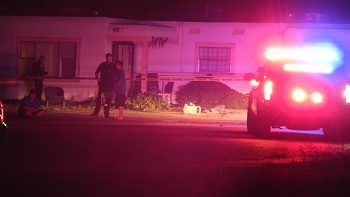 Upon arrival, they learned a 34-year-old Artesia man was killed in the late evening hours at that address following an argument over allegedly stolen property. The victim, identified as Ronald McLean, of Artesia, was shot once in the head. The suspect, identified as 25-year-old Ruben Lopez of Artesia, was arrested this afternoon without incident, the APD reports. Officers gathered physical evidence at the scene Monday and are continuing to obtain testimony from witnesses. According to the criminal complaint supplied this afternoon by the APD, after McLean was transported from the scene to Artesia General Hospital, officers made contact with his girlfriend, who advised the couple had been at home when a family friend, identified as Lopez, arrived and began yelling at the woman’s nephews. The woman told police Lopez was upset about a dog her nephews had sold him Sunday and was claiming the dog was stolen. She said Lopez began threatening to take items from the home in return, at which point, the report states, Lopez pointed a gun at one of the nephews. When the woman informed him he would not be taking any property from her home, he allegedly turned the gun on her. At that time, the woman said, McLean attempted to intervene. She says Lopez pushed McLean, causing him to fall backward, then shot him. Witnesses present at the time confirmed that sequence of events. McLean was pronounced dead at 1:44 a.m. today. Lopez was subsequently charged with an open count of murder and aggravated assault with a deadly weapon. 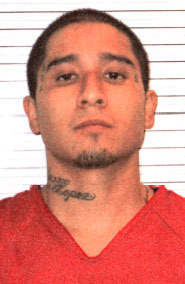 Lopez was previously arrested Feb. 2, 2015, in Artesia on charges of aggravated battery with a firearm following an incident in the 1200 block of West Missouri Avenue. Lopez had entered the residence of his ex-girlfriend and confronted a male subject inside, first firing a shot into the floor and then, when the male attempted to tackle him, firing at the man, hitting him several times. Lopez exited the home, drove to the end of the block, and then returned to the alley behind the residence, at which time he approached an Eddy County Sheriff’s Office deputy and informed him of what had occurred. Lopez was released from the Eddy County Detention Center on probation in October 2016.